This Portal provides potential Short Course applicants and nominees with access to the Online Applications System. 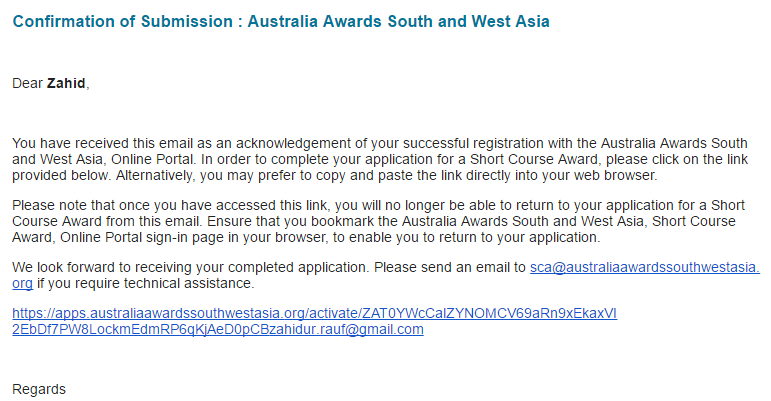 It enables registered users to make an application for a specific Australia Awards - South and West Asia short course. The first step is to register on the Short Course Online Application System https://apps.australiaawardssouthwestasia.org as this will enable you to logon, create and complete an application for a short course. On registering your details on the Australia Awards - South and West Asia Portal, an email confirmation message will be sent your email account. This message will contain a link that will enable you to activate your account. If you have not received this email within 5-10 minutes in your inbox, please check your spam or junk email folder. 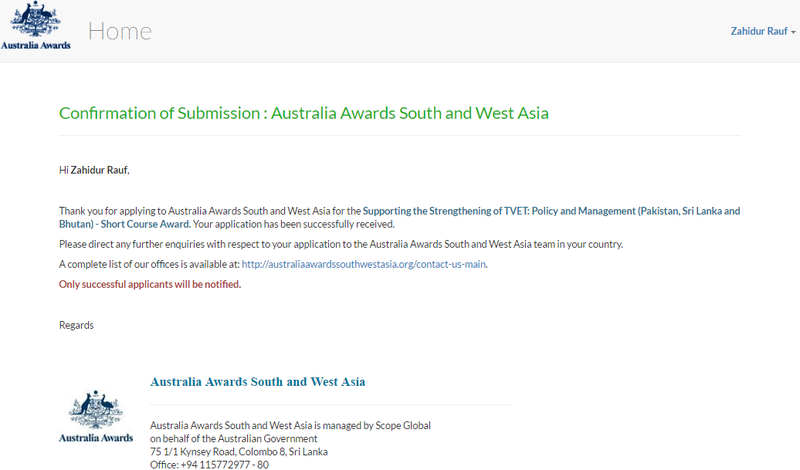 If you are unable to locate the email confirmation message from Australia Awards South and West Asia, please send an email to sca@australiaawardssouthwestasia.org and ensure that you provide the email address that you used to register on the Portal. Short course nominees and applicants must not be current serving members of the military. Step 3. Complete the New User Registration screen and click Register. An email will be sent to your registered account. It will contain an embedded link. Click the link provided to activate your account. The email content is shown in the figure 4. After clicking this link you will be redirected to the home page of the Short Course Online Application System where you will find a button to start your application. Please save the home page to your favourites folder to ensure you can locate it when progressing though your application. If you end a session prior to completing your application, you will need to log into the next session using your credentials. If you cannot remember your password you will be able to reset your password by clicking “Forgot Your Password?” button located on the bottom section of the login screen. 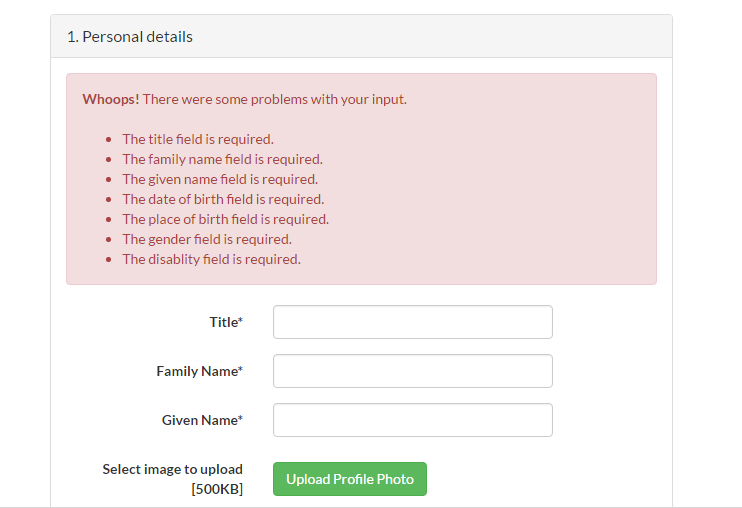 All fields that have an * next to them are mandatory. These fields must be completed. Dates must be inserted in “yyyy-mm-dd” format. 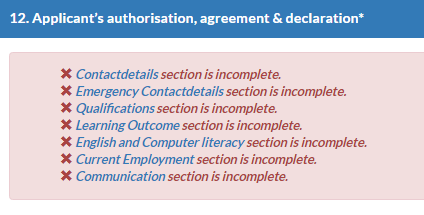 If you do not complete the nine (9) mandatory sections but commit to submit your application in the “Declaration and Acknowledge” section the error message in the Figure 4 will be displayed. There are a few text fields where multiple lines of text can be inserted, allowing you to enter additional information to support your application. These fields have Character Limits. ‘Characters’ include letters, numbers, spaces and punctuation marks. It is important that you stay within the character limit as the System will not allow you to enter more than the limit. You will be not be able to complete and submit your application until you have removed the additional characters. Please refer to Figure 12. An applicant must complete the nine (9) mandatory sections before submitting the application. 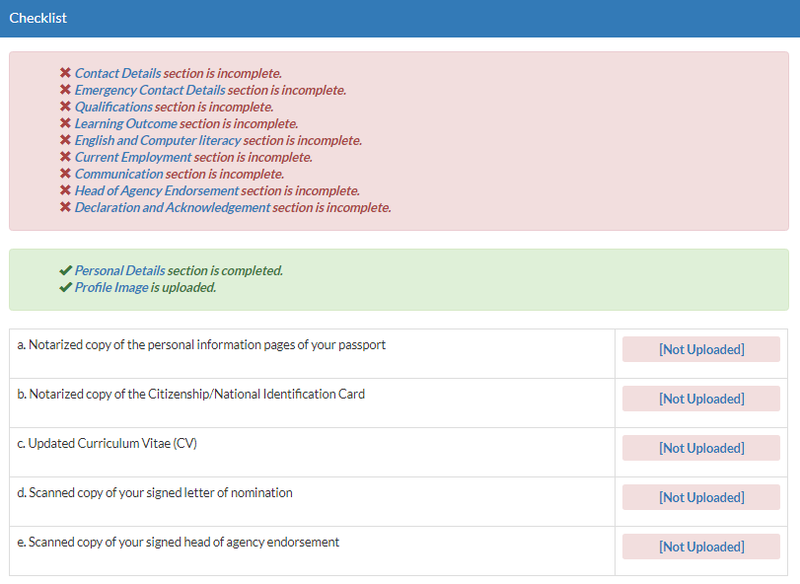 An applicant must read and agree with the terms and conditions mentioned in the “Declaration and Acknowledgement” by ticking the check box and then clicking the Submit button in the bottom. 1. An application is considered as completed when an applicant completes the nine mandatory sections (mentioned under Section 4. Completing an application title). 2. When an applicant completes the application, they should check the declaration and click the Submit button. The system will verify the completeness of the application. 4. Only after completing the incomplete sections an applicant will be able to submit an application successfully to the Short Course Online Application System. 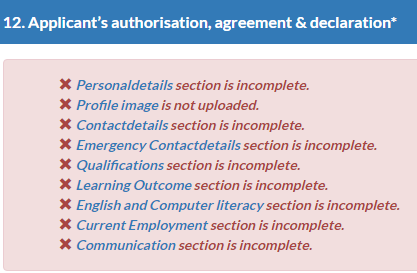 System do not sends any confirmation email to the applicant only generate the Confirmation of Submission page. Once an application is successfully submitted, the system will automatically generate a Confirmation of Submission page. Shown in the Figure 17. 8.1 What Web Browsers work best with Short Course Award Portal? 8.2 How do I remove browser add-ons or extensions? Most web browsers support useful third party add-ons (ex: plugins, extensions) that can add new features and functionality. However, if an add-on or extension is malicious, it may cause you to experience issues with your user account. 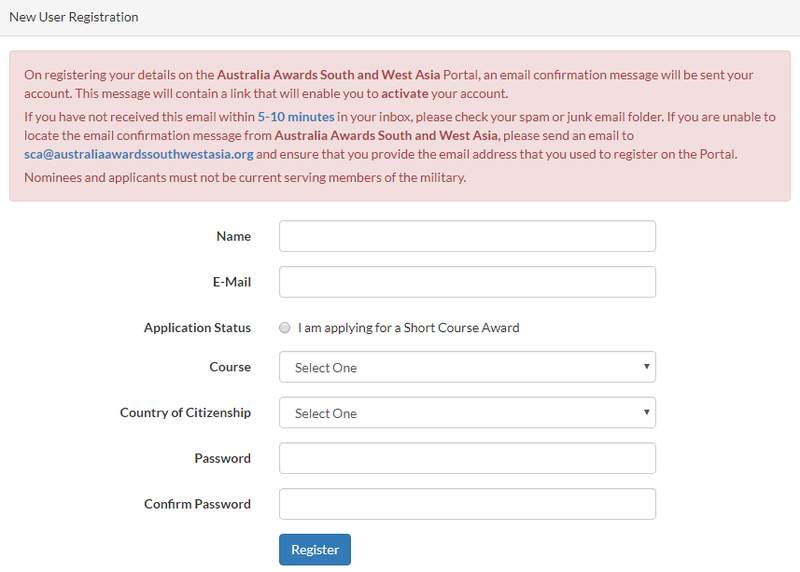 8.3 How do I access the site if I can't login to the Australia Awards Short Course Portal? If you find that you can't login to the Portal using your email address and password, follow the steps below. Clear browsing histories, Download history, Cached images and files, Cookies and other site data etc. and try again. If it does not work go to the next option in this list. Check your internet connection. If internet connection is there and you are still facing problems to use the Short Course Online Application System then go to the next option in this list. Check your internet speed. Is it fast enough for to complete the application? If not then try with better internet facility.